Sulfur dioxide is an inorganic colorless gas with the molecular formula SO2. It has other names like sulphur dioxide, sulfur (IV) oxide, sulfurous anhydride, and sulphurous anhydride. In high concentration, it becomes toxic and harmful to the the environment, resulting in acid rain. The molecules of sulfur dioxide combine with water molecules forming acid rain. Also, it causes health issues such as respiratory problems at low concentration. Therefore, people with asthma need to be careful when handling sulfur dioxide. To handle it, wearing safety glasses, gloves and well ventilated surrounding are preferred in the laboratory. If you get sulfur dioxide in eyes or skin, wash it off with lots of water and then get medical help. Sulfur dioxide (SO2) is comprised of the sulfur atom and two oxygen atoms. According to electron-counting formalisms, both the sulfur atom and the oxygen atoms have oxidation number of -2. Therefore, it forms a bent molecule with C2v symmetry point group and also called as a hypervalent molecule because of surrounding 5 electron pairs. Sulfur dioxide is mainly used in winemaking as an antibiotic and antioxidant. There are unsulfured wines containing 10 milligrams of sulfur dioxide per liter. As a antioxidant and antibiotic, it prevents bacteria and oxidation to spoil wines and maintain volatile acidity. When a winemaker puts sulfur dioxide, he needs to label it "contains sulfites" if it contains above 10 parts-per-million (ppm). However, under 10 ppm, he does not need to label them. Moreover, sulfur dioxide plays an important part in winery sanitation. Through its acidity, it is used to clean the equipments used in winemaking in the way not to affect the wine. With a little amount of sulfur dioxide, it can be used in biochemical and biomedical fields, excluding mammalian biology. Avoid exercise or play at high air pollution level. People with asthma need to stay indoors. People with asthma or respiratory problems should avoid foods containing sulfur dioxide or other sulfites. 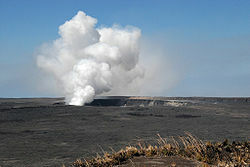 Regularly check whether there is any leak of sulfur dioxide. Use stoves that fit into Environment Protection Agency's standards. Place the exhaust fan above the stove and use it frequently. Open a flue while burning. Do not use gasoline-powered appliances. Use ovens and heating equipments that run an electricity. Use appliances that have high-leveled ventilation. Try to use public transportation, or walk short distances if possible. Eat foods with less sulfur dioxide. Eat fresh, organic fruits and vegetables. According to the United States Environmental Protection Agency (EPA), the emission of sulfur dioxide has been constantly occurring from 1970, leading not only to human health problems, but also endangering to the whole environment. Sulfur dioxide is a main precursor of acid rain along nitrogen oxides. When it meets water molecules at the atmosphere, it forms acids which will later cause acid rains. Acid rain acidifies lakes, streams, soils, and does not offer a beneficial environment to the animals living in those areas. It also corrodes buildings, monuments, and statues especially made of limestone. It even discolors materials through corrosions. Fine particulate soot is another result from sulfur dioxides. It causes people some health problems. Sulfur dioxide is simply toxic and corrosive, especially in high concentration of sulfur dioxide when it becomes a severe threat to the respiratory system at low concentration. Asthmogenic people need to be careful to treat sulfur dioxide since it may cause respiratory problems. If one experiments with sulfur dioxide, one should consider ventilation to make sure no direct exposure of it occurs. When sulfur dioxide combines with moisture, it becomes a corrosive and acidic solution which can result in burns if contact to skin or eyes occurs. To deal with sulfur dioxide, one needs to wear safety glasses and to make sure that it does not leak into the air. Also, if needed, gloves made of neoprene, nitrile or natural rubber are good to use during experiments. If one gets sulfur dioxide on one's eyes, one should fully wash it out with lots of water and ask for a doctor's assistance. If it touches the skin, like the way how one treats eye contact, washes it out with water and gets medical help. However, if one inhales sulfur dioxide gas, one needs to get immediate medical help. One may show signs of distress. ↑ Sulfur dioxide and its properties TRAMFLOC, INC., Accessed on Feb 5.2011. ↑ 3.0 3.1 3.2 sulfur dioxide New World Encyclopedia contributors, New World Encyclopedia, November 1. 2008. Sulfur Dioxide U.S Environmental Protection Agency. Air Trends U.S Environmental Protection Agency. This page was last modified on 29 August 2014, at 20:09.